The Ford Mustang is back and better than ever for the 2019 model year, and we’ve got it right here at Akins Ford near Atlanta, GA. Seeing as it’s been the best-selling sports coupe on the entire planet for the last three years, the Ford Mustang is well-known as the go-to vehicle for anyone looking to go on the ride of their life. That’s even more true for the 2019 model year, as the 2019 Mustang lineup has received numerous updates, upgrades, enhancements and improvements that make it more powerful, more capable, more efficient and more fun to drive than ever before. And we can’t talk about a new Ford Mustang lineup without first talking about what’s under the hood. The 2019 Ford Mustang lineup features three engines to choose from. One is a 2.3-liter EcoBoost engine offering 310 horsepower and 350 pound-feet of torque. Another is a 5.0-liter Ti-VCT V8 engine offering 460 horsepower and 420 pound-feet of torque. Finally, there’s a supercharged 5.2-liter Coyote V8 engine, though Ford is keeping those power numbers under wraps for the time being, as it won’t be released until later in the model year. The engine lineup of the 2019 Ford Mustang lineup isn’t its only impressive new performance feature. The 2019 Mustang lineup also features two transmission options – a 6-speed manual transmission and a 10-speed SelectShift automatic transmission – and five performance settings – including Normal, Track and Drag Strip modes. The 2019 Ford Mustang lineup also features a new Quiet Start mode, an all-new B&O PLAY premium audio system, an available SYNC 3 infotainment system, an all-new class-exclusive quad-tip fully variable active valve performance exhaust system, a trio of all-new exterior color options, and a pair of all-new trim levels – the 2019 Ford Mustang Bullitt and the 2019 Ford Mustang California Special. That is all in addition to a comprehensive suite of advanced new safety, technology, comfort and convenience features. 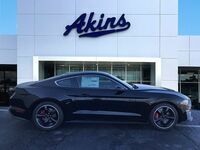 If you’d like to learn more about the 2019 Ford Mustang lineup, please don’t hesitate to get in touch with our friendly and knowledgeable staff here at Akins Ford near Atlanta, GA.